4/1/2012 – Wouldn't it be nice to see your opponent's preparation? Follow what the chess community is currently studying? Or even predict novelties before they are played? Well, it can be done. Our cloud database Let's Check creates a special LiveBook which you can use to look into the future, and follow other people's work – in real time, as it is happening. We can tell you how. Let's Check, the function built into the latest Fritz 13 program, has been touted as the second coming in chess functionality. Deservedly so, although many users are still unclear about its power. In this tutorial we will explaing one of its less understood features: its ability to predict the future and allow a player to avoid those nasty openings surprises. Now if you click on the "LiveBook" tab above the notation you get full statistics of the games in which this position occurred. Just like in any regular openings book, except of course that this book is quite up-to-date. In fact tournament games are usually updated the minute they are finished – quite literally. The Live Book shows the continuations 8...Be7 on top, with 3040 games in which this move occurred, and 8...Nbd7 in second place, with 1591 games. In third is 8...h5 with only 451 games. Simple! It is clear that 8...Be7 and 8...Nbd7 are the most popular by far, right? Wrong! What we have here is a new source of information that does not simply show what has been played, most often in the near or distant past, but what people are looking at most right now, and thus where new developments are most likely to appear in the near future. This is the Let's Check crystal ball. To the right is a column called "Visits". Every time someone looks at a move through Let's Check, this counter is ticked, whether they contributed something or not. The "Visits" column tells us which moves are being looked at the most, and in our example we can see a very notable curiosity: 8...h5 actually has many more visits than any other move. In other words, something is cooking! When we reach this point something clearly sticks out. The third most played move has in fact nearly ten times the number of visits of the top move: 10.Nd5 has just 85 games, but almost 8000 visits. And behind this move you will find a full tree of theory containing many moves that have not occurred in OTB play – i.e. they are marked with zero games, but have been visited often by Let's Check users. If ever there was an indicator that one can expect something in a line this is it. It's a very interesting example. 10.Nd5 represents an extremely volatile position in which Black has been scoring well in recent times. 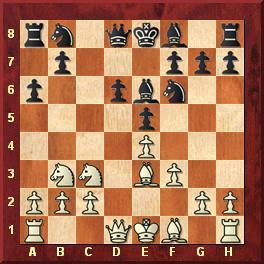 Anyone who plays the Najdorf is not satisfied to secure a draw but wants to obtain winning chances. But that is hardly possible in the previous main lines in which Black allows g2-g4-g5, even though according to current theory White too cannot gain a decisive advantage with the pawn storm. In correspondence chess almost all top games end in a draw. MegaData 2012 + games from 2012: total 592 games. Black score since the beginning of 2010: 63.7% in 84 games. You will notice that the highlighted move, 14.Rac1 has zero games attached to it, i.e. it has never been played in serious tournament game, but has had a huge 2249 visits. That means that more people have looked at it than the most oft-played choice to date. It does not take a genius to realize that theory is being actively developed here, and it won't be long before this starts appearing in games. Maybe for the first time in a game against your next opponent?! A final word: if you are worried that all this kind of preparation can leave leave information for other players you should bear in mind that while your visits to any position will always leave tracks – when you are working within the Let's Check system – it will not leave the name of the player visiting it. If you go into a position that has never occurred in a tournament game, and has never been visited by a Let's Check user, you will leave a track. The next person visiting that position will see that one user has been there before him, although he will not be able to tell who it was. 25.11.2011 – What do the players in a world chess championship do immediately after their games? Rush off for dinner? No. Check their game with the computer? Warmer. Actually in Tirana the two GMs used, for the first time in such an event, the new feature of Fritz 13, "Let's Check", to see what spectators from all over the world had found in their games. Here's how it is done. 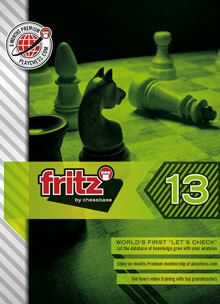 31.10.2011 – You have ordered Fritz 13, on DVD or as a download in the ChessBase Shop. And you have heard a lot about the new Let's Check function. How do you get started? In our tutorial series we begin with some very basic instructions on how to activate the program and then take a few initial steps into the world of cloud computing. Too daunting? Take a look – it's easier than you think. 20.10.2011 – In round two Vladimir Kramnik beat Judit Polgar – as usual, we are tempted to say. In twenty classical encounters Judit still has to win a single one. At the end of this game Fritz 13 surprised people on Playchess by announcing mate in 45 moves – on a super-fast spectator machine. In rounds three and four all games were drawn, but some of them quite interesting. Report and commentary. Fritz 13 is now available – let's check who needs it! 13.10.2011 – “Success very often is the enemy of future success," Garry Kasparov warned us some months ago. Changing the world once is not enough, he said, we needed to do it again. Well, we are trying. Today we launch Fritz 13, which incorporates a tantalizing new feature: "Let's Check", which provides communal analysis in the cloud. You can order it now or download it for instant access. 20.03.2012 – Many may not realize that there are inherent differences in the versions of Playchess that come either Fritz 13, or ChessBase 11. One function they both provide, that does not come with the standalone Playchess program is the "Tactics training". This adrenaline rush test, is a five-minute quiz in which you must solve as many positions as possible. Find out more and see how well you can do! 16.03.2012 – Tactics are the building blocks of chess, without which strategy will fall flat on its face, and for this reason regularly working on tactical test suites is always of interest. While you can buy any number, whether from the ChessBase Shop, books, or other, Fritz 13 also provides the means to easily construct endless new ones for you to test yourself. Learn how in this tutorial.